When Kona announced its redesigned Process bikes in 2013, we knew it was a turning point in mountain bike design. The new bikes featured longer top tubes paired with shorter stems. They also had uber-short rear ends, and were purpose-built for dropper posts. This year’s Process 111 is the big-wheeled bike in the lineup, and it’s a much more capable rig than its 111-milimeters of rear suspension suggests. The geometry chart pretty much guarantees that this thing is going to be a blast to ride, but how did our testers get on with the 111’s suspension and componentry? Watch the review video to find out. 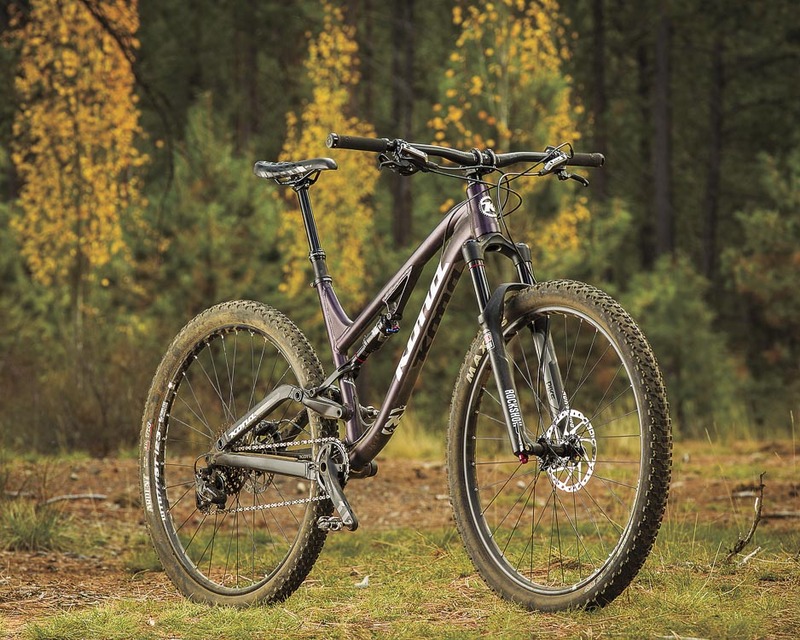 Kona's Process lineup is geared toward enduro performance and trail fun. The Process 111, Kona's 29-inch offering, presents riders with a mixed bag of concepts in a package aimed at all-round rideability with a nod to gravity. Sub-17-inch chainstays meet a long front end and generous wheelbase with a shortish 111 millimeters of travel. The aluminum frame is draped with components aimed at performance without slaughtering the bank account, in this instance represented by a SRAM X1 drivetrain and Shimano SLX brakes. Don't consider the SLX brakes a downgrade; for the price they are an absolute kickass stopper. Bump-sucking duty is handled by RockShox with a Pike RC 120 up front and a Monarch RT in the rear. A KS Lev dropper post, and Kona-brand bars, stem and grips round out the cockpit, with WTB saddle and rims and Maxxis Ardent tires finishing the package. The geometry of the Process 111 is wonderful for tearing into trail. It is balanced and stable, corners beautifully and sticks lines with the best of them–with the caveat that some testers felt the bike has an aggressive enough feel that riders can easily find themselves at mach speed in terrain that is more than the limited rear travel can handle. One tester felt that adding the larger-volume DebonAir can to the Monarch shock would benefit this bike. That said, the suspension performs well at bump absorption for the travel that it has on descents. We had questions about the new bikes before we even got our test rigs, so we sent out a few queries—the kind of things we thought you might be asking yourself when you're looking at this bike. Then we sent out another round of asks if any major questions or issues came up during testing. Here's the feedback we received from Kona’s Product Manager, Chris Mandell. VERNON FELTON: Who's the ideal rider for the Process 111? CHRIS MANDELL: Hard one to answer…Any bike is just a tool in the hands of the rider. For me personally this bike feels 'ideal' because it bunny hops like nothing else, has traction for days and accelerates in places which it shouldn't which scares me. But I can think of other riders who like it because it has the snap of an XC bike but with the monster trucking ability of a 27.5 – 150mm bike. A lot of what is going on with this bicycle is the interplay between travel, wheelsize and geometry. We are 'buying' the ability to excel in technical terrain with excellent geometry (fit and frame) and wheelsize. The travel is just there to take the edge off. VF: What were you aiming for, in terms of ride traits, when you designed the 111? CM: We wanted the maneuverability and responsiveness of the Honzo but with just enough travel to take the edge off and provide grip. VF: How did you, from a design and engineering perspective, achieve those goals? CM: A lot of hard work. We started by spending a lot of time balancing the STA, travel amount, BBD and Chainstay length in a 2D model. Once we had a range of what we thought was workable we jumped into the 3D modeling to sort out what was actually workable given the constraints of 29" wheels. Really the hard part of this bike was not designing it. The hard part was creating the vision for it, staking out the fresh ground where this bike was to live. It meant we had to look beyond the 27.5 hype and mentality that 29ers are only for XC…we had to innovate. VF: When the Process 111 debuted last year, it was kind of on its own desert island. I mean, Banshee's Prime was coming from a similar direction, but it had more travel. For 2015, however, the Process 111 has a lot of company: there are now a fair number of aggressive, slack-geo, low-slung, long front-center, short-travel 29ers (how's that for an endless list of modifiers?). So, what sets the Process 111 apart from some other bikes in this growing niche? CM: We have the gold star for being first to the party? My review of the other bikes now in this category suggests that we are still leading the charge: Longest reach and a lower TT than our competition. VF: If someone is looking at the Process 111, they're probably also eyeing the Process 134, the slightly longer-travel, 650b sibling. The two bikes can tackle a lot of the same terrain. What kind of rider would be better suited, then, with the Process 111? CM: Good question. The Process 111 and 134 are equally capable bikes, they just do things differently. So it is a little bit hard to talk about pros and cons but perhaps temperaments? Terrain also plays a role. If I lived and rode in Bend I would get the Process 111. Whistler? The 134. Santa Cruz? The 111. Bellingham? I would want both. Want to know more about Kona’s Process bikes? Click here to watch our exclusive “Blueprint” feature.